The MD18 Wall Mount Workstation extends for long reach, and the slim design stows compactly against the wall. You can sit or stand at this workstation, increasing productivity and avoiding “sitting disease”. You can adjust your monitor for your comfort and best viewing angles. It tilts and pans and can be rotated to portrait position. 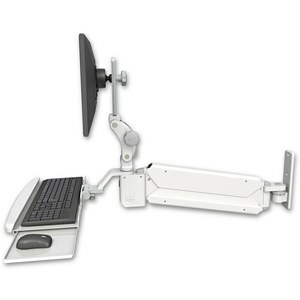 The monitor can also move 6″ up and down, and 5″ forward and backward. The MD Arm Wall Mount is available in wall and wall track mounting options and is offered in a wide variety of configurations to meet your specific needs. The model shown has a keyboard tray with built-in wrist rest and a mouse tray that slides out on both sides. The keyboard tray flips up and out of the way when not being used. The MD18 with Flip Up Keyboard reaches 43″ (109 cm) and stows 10″ (25.4 cm) from the wall. The MD18 with WorkSurface Tray reaches 53″ (134.6 cm) and also stows 10″ (25.4 cm) from the wall. The arm rotates 180° at the wall and can move 25″ (63.5 cm) up and down. The MD18 is also available in the MD12 model for workspaces that need shorter reach.